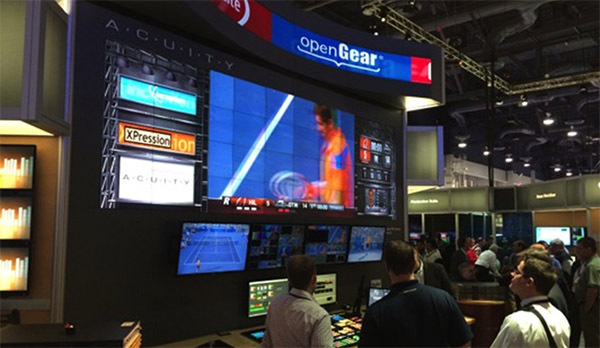 Our friend Terry Belanger from Winnipeg once again delivered a NAB 2014 Recap. 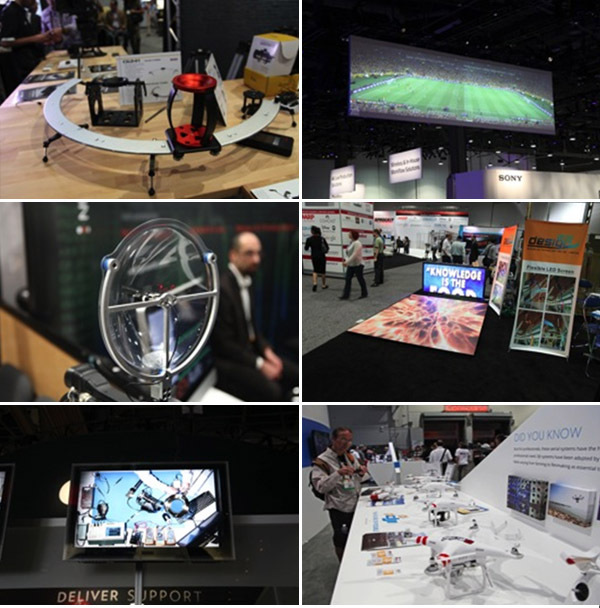 There were 1746 booths using 945,000 sq ft of convention floor and exhibits from 159 different countries. A total on 98,015 people attended the show. Of those about 25,000 were not from USA. 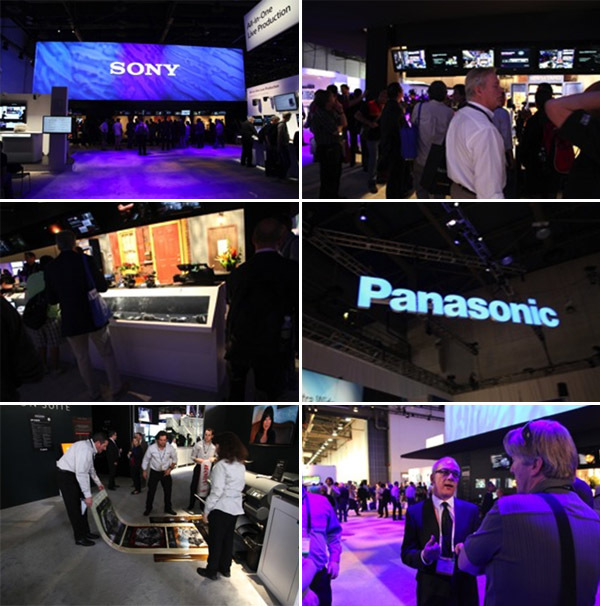 I had been reading reviews and recaps of NAB 2014. I am thinking that NAB is getting so big that you can see 20% of the show and that will fill four days alone. I spent most of my time in Center Hall where I saw Canon Sony, Panasonic,JVC and so much more. And some really cool small booths. The world of video is ever evolving. It was less than 20 years ago that Standard definition evolved into High definition. The first American broadcast was on Oct.1998. 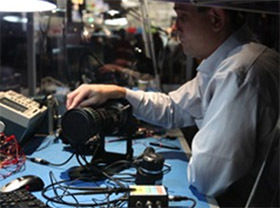 For the last two years NAB was the place to see 4K cameras. All the big players like Sony, Panasonic and Canon were there plus a surprise from AJA called CION. What I found noteworthy was how distribution of 4K is falling into place. NAB is a broadcast show, so when I say 4K I am talking about something call DVI (Digital Cinema Initiative) The specification is 4098 x 2016 Pixels with a aspect ratio of 17 x 9. The 4K you see at home is UHD (Ultra High Definition) and is 3840 x 2160 and a 16 x 9 Ratio. Electronic theaters are DVI. As newer and newer cameras enter the market place the cost seems to get lower and lower. 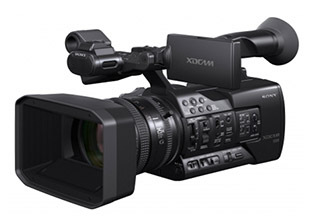 Don’t be fooled by a BlackMagic Design Production camera selling for $3500 is in the same class as a Sony PMW-F55 selling for over $30,000. My point is that to shoot in 4K is not an expensive option. I recently discovered that for that for the last 15 years I have been shooting in 4K. Stills from my DSLR are stunning on a 4K monitor. It is just now that full motion is getting caught up to where still photography has been for years. I have heard over and over again that the broadcaster’s are just at 1K why bother with 4K till they upgrade? That was sort of true back when SD was the norm and HD was the NEW format. Going forward I think the broadcasters will lag behind streaming content. 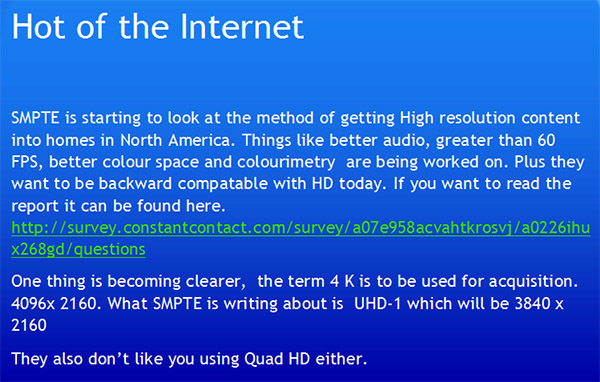 Keep an eye on something called HEVC (High Efficient Video Codex) also called H.265. Go to YouTube today to download 4K content and this year Netflix will be streaming 4K programs. Tucked in the corner of central hall was Sony. And again, it is a MUST SEE exhibit. From their booth you could see 4k live streaming. Also on display was a new PXW-X180 that will be available this fall. The new feature of the X-180 is a Variable ND filer from 1/4ND all the way to 1/128ND. It also has a wireless LAN to communicate to a smart phone or tablet. Something that I liked a lot is the new Sony Digital wireless microphones. They have an optional mounting base that links the receiver to the camcorder without any cables. It even used the camcorder battery to operate the receiver. It is nice to see they added USB for changing batteries also. We were invited to a private Ross event Sunday night at the Tuscany resort. We got there even before we checked into our hotel. As it was we were 15 minutes late and walked into a darken room. I heard applause from the crowd. David Ross was on stage listing all the accomplishment. Ross has done in the past 12 months. It is a LONG list. Go look at this site so see what this Canadian company is into now. Ross has raised the stakes in high-end switcher’s with a NEW series called ACUITY. Ross is now in the mobile Production market with Ross MCP and the launch of Open Truck Initiative. Ross was demonstrating a fully integrated sports venue solution above. They were using Acuity’s powerful ME architecture, external device control capability and XPression CG to generate the primary score board display AND feed the ribbon board up top. All this augmented by Ross’s free DashBoard control system. A totally unique and powerful end-to-end venue solution all from one vendor! It was not many years ago that Canon was just a 20’x20’ booth and now they must be one of the biggest at the show. I had to take a photo of this banner. One hundred million lenses is a lot of glass. I was invited by a nice woman to stop by the Canon booth with my camera. She gave me a coupon to have my Camera cleaned by a canon Optical technician. I was directed to a room up on the 2nd floor. Several tables were manned by technicians all busy working on SLRs. I gave them my camera and was asked to return in 4 hrs. I was handed back my 5D that got completely cleaned and even a small repair done. I didn't think my camera was dirty till I got it back in my hands. I was so impressed that I had to mention here. They even gave me a Canon T-shirt. Again tucked in the corner of the north hall was NHK and their 8K display. Don’t compare 8K and 4K. It is like comparing HD to I-MAX. If you ever do get a chance to see a 8K presentation I highly recommend that you to take it in. I was amazed at the fireworks they captured. You could even see the birds being startled by the fireworks. I do suggest you get their early enough not to sit in the front row as I had a sore neck afterwards. They are Canadian made and the best case I have ever seen. We should have stock this month. DJI also had a big booth this year. I am not sure even if they were at last year’s show. Once the government has come to terms with who can fly these drones (for profit) watch out. They will be as popular as Go Pro has become. Again for the 4th year I stopped at the Comer booth. And again I was impressed. We can now offer LED spotlights. Way too many cool toys. You had to be careful of information overload. 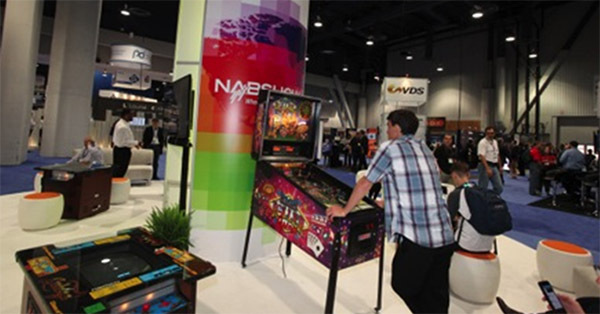 Maybe next NAB which will be April 13th to 16th 2015 you will be there! Any show that has a pinball machine that’s free to use must be a GREAT show. I just wish I had the time and energy to play a game. I would appreciate any comments or questions tbelanger@advance.mb.ca.